At our institution, patients are seen four to six weeks after open partial nephrectomy for routine follow-up and have a physical examination, serum creatinine level check, and an excretory urogram (14). Imaging with CT or ultrasound is performed earlier on any patient who has clinical signs or symptoms of abscess, hematoma, urinary leak, or fistula. Generally, a CT scan with intravenous contrast should be performed, and if a urine leak is of concern, delayed images should be obtained. Postoperative surveillance for recurrent disease should be tailored according to the initial pathological tumor stage (14). All patients are evaluated annually with a history, physical examination, and blood tests, including assessment of serum calcium, alkaline phosphatase, liver function, blood urea nitrogen (BUN), serum creatinine, and electrolytes. Patients with T1 tumors do not require early postoperative imaging because there is a low risk of recurrent malignancy (48,49). A yearly chest radiograph is recommended for patients with T2 or T3 tumors, because the lung is the most common site of metastasis. Low-dose chest CT may also be used. Patients with T2 tumors should have a CT examination every two years. Patients with T3 tumors have a higher risk of developing local recurrence, especially during the first two postoperative years, and they should have a CT examination every six months for two years, then at two-year intervals if there is no documented tumor recurrence. The effectiveness of renal tumor ablation and laparoscopic partial nephrect-omy has not yet been proven in long-term follow-up studies, and therefore imaging protocols following the procedure are not standardized, varying among institutions. In our opinion, conservative surveillance is appropriate. At our hospital, patients who have had laparoscopic partial nephrectomy undergo follow-up, with abdominal and pelvic CT and chest X-ray being taken at six months, at one year, and then at yearly intervals. Patients who have had cryoablation undergo postoperative MRI at one day, one month, six months, one year, and annually thereafter. 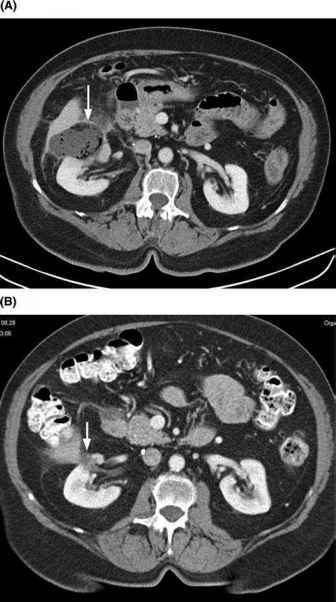 In most instances, contrast-enhanced CT is the test of choice to search for tumor recurrence in those patients with a normal serum creatinine (50). 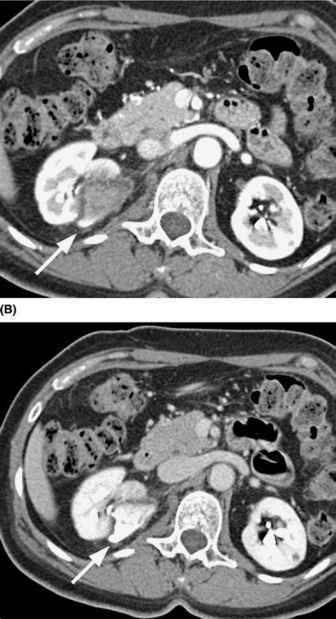 Contrast enhancement is important in detecting visceral organ metastases and local recurrence, but there is a risk of nephrotoxicity from iodinated CT contrast in those patients who have had NSS or those who have compromised renal function. Although MRI is not generally used as a screening examination, in patients with renal insufficiency it is a reasonable alternative to CT, because the gadolinium contrast used does not pose a risk to renal function. 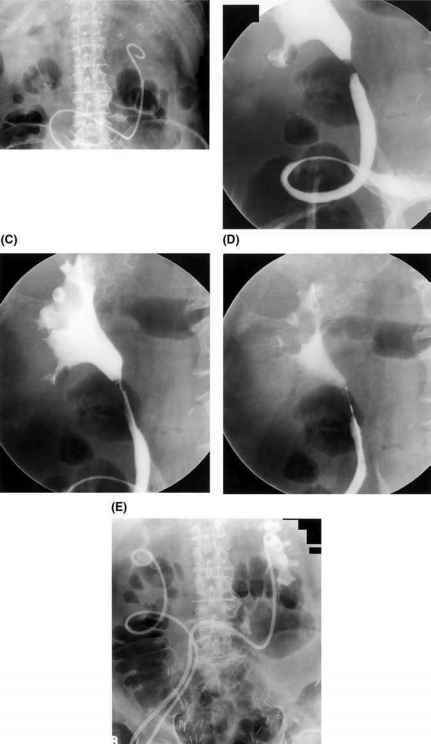 Figure 20 Recurrence at site of open partial nephrectomy. A 62-year-old woman had left open partial nephrectomy and right radical nephrectomy 2.5 years earlier. 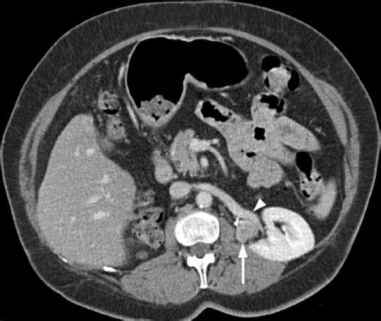 Contrast-enhanced CT shows a round soft tissue mass (arrow) abutting surgical clips and left renal vein (arrowhead). Abbreviation: CT, computed tomography. Figure 21 Postoperative urine leak following partial nephrectomy. If entry into the collecting system is not identified and repaired at surgery, urine leaks can result. 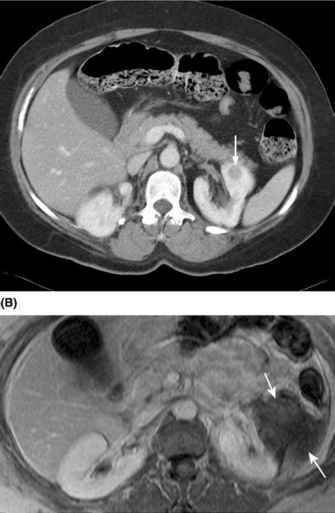 (A) This patient has a perinephric fluid collection (arrow) after partial nephrectomy that fills in with contrast on (B) a delayed scan. for residual disease. These postsurgical changes can include perinephric fluid, fat necrosis, urine leak, scarring, or a defect at the operative site (Figs. 21 and 22). Hemostatic agents, such as oxidized cellulose (Surgicel, Johnson & Johnson, Arlington, Texas), may be present (51) and can mimic abscess formation (Fig. 23). Figure 22 Postoperative hemorrhage following partial nephrectomy. The mass (arrow) in (A) was resected laparoscopically; the patient complained of left flank pain following the surgery and had a low hemoglobin. (B) Postoperative unenhanced CT scan shows a large perinephric hematoma (thin arrows). Abbreviation: CT, computed tomography. Figure 23 Oxidized cellulose (Surgicel) mimics abscess at laparoscopic partial nephrectomy site. This patient presented to the emergency department with flank pain after laparoscopic partial nephrectomy and had a normal white blood cell count. 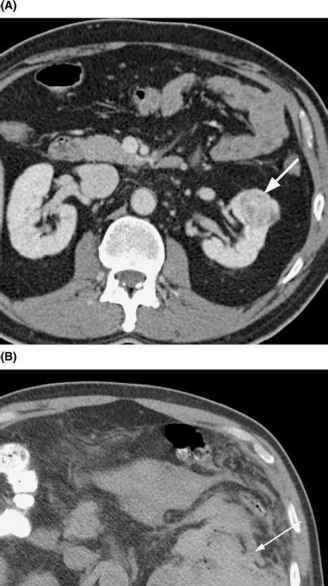 (A) Contrast-enhanced CT demonstrates an ovoid collection with scattered gas foci at partial nephrectomy site (arrow). No intervention was performed. (B) CT six months later shows resolution of collection with minimal residual low attenuation (arrow). Abbreviation: CT, computed tomography. After ablation, the mass progressively decreases in size over time (52,53) and eventually presents only as cortical defect (Fig. 24). Incomplete ablation is seen as a residual enhancement at the site of the mass. In our experience, enhancement or a mass-like contour change suggests recurrent disease (54).